G is for Grainger Market | The Tales of Missus P.
Grainger Market is an old indoor marketplace that still brings in a ton of shops. It was crowded on the Saturday we went and I was amazed how it was like a whole section of the city within a big, domed roof. I’ve seen the painting by Louis Grimshaw of Grainger Street at the Shipley and prints of it all over town. Nice to know that something with that much history is still up and running as it was intended. 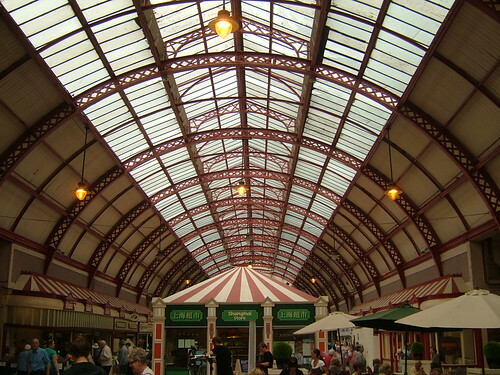 The Grainger Market was the town’s first indoor market, situated between the New Gate of the old Town Walls and the newly laid out Grainger Street. At the time of its opening in 1835 it was considered the most spacious and magnificent market in Europe and the Evening Chronicle described it as ‘the most beautiful in the world’. To mark its opening, a grand dinner was held, complete with an orchestra and attended by 2,000 guests. Other “G” mentions include: Geordie, The Gate, Greggs, Gateshead College, and Gateshead itself.